Popular in both the U.S. and England, the cocker spaniel was originally bred as a gun dog that pushed game to hunters in the field. Originally, there were only two types of spaniels – those that hunted primarily on land and those that took to the water to retrieve game. Through time, those two classifications became more and more varied as specific breeds were developed. The cocker spaniel was used more on land (its name is derived from aptitude for woodcock hunting) and is among the oldest of gun-dog breeds – with its heritage dating to the first spaniels that came out of Spain more than 500 years ago. As the happy-go-lucky cocker spaniel became more popular, and with the rise in conformation competition after 1885, a split took place in the breed – those dogs used for the field and those who competed in the ring. 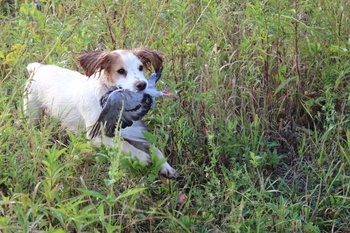 Most noticeably, field-bred cockers have a shorter coat and ears than conformation dogs, as well as a higher prey drive. The cocker’s popularity soared in both realms, as well as in the pet world. In the show ring, the cocker has been the most successful breed at Crufts, winning Best in Show seven times since 1928. In the gun-dog world, cockers have served as the foundation stock for several breeds, including the field spaniel and the American cocker spaniel. The American cocker was originally a gun dog, but the breed was so popular that conformation lines have overwhelmed the stock; the result being that if you want a cocker spaniel with proficiency in the field, you just about have to select one from English lines. Intelligent, hard-working, loyal, athletic and always tail-wagging happy, cockers rank 18th in Stanley Coren's The Intelligence of Dogs, scoring excellently in working/obedience intelligence. While happy and friendly, cockers can be dominant and, rarely, aggressive towards strangers, other dogs and even their owners/family members. Like springer spaniels, cockers can sometimes suffer from “rage syndrome” – when a dog will suddenly attack without warning or provocation. It’s a rare circumstance, but one that has been documented studied in the breed – something to keep in mind if you plan to have them around children. As smaller, medium-sized dogs, cockers live about 12 years on average, and do not suffer from high incidences of structural issues such as hip dysplasia or patellar lunation. They do suffer from high rates of cancer, eye issues such as cataracts and progressive retinal atrophy and allergies. At Paw Print Genetics, we screen for five known genetic mutations that affect English cocker spaniels. The English cocker spaniel panel test includes degenerative myleopathy, familial nephropathy (Group A), glycogen storage disease VII (Group B), progressive retinal atrophy (PRCD) and exercise-induced collapse, which is extremely important to screen for if you’re interested in a field-working dog. To celebrate the English cocker spaniel, if you order the breed’s five-test panel screening by Nov. 10, 2013, you will receive 15-percent off your order by using the code “FBECS” at checkout.